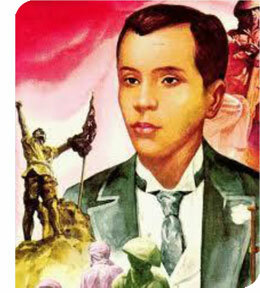 Andres Bonifacio is regarded as the Father of the Philippine Revolution against Spain. He also is known as the Father of the Katipunan, a secret revolutionary society he founded in 1892 and whose goal was to win Philippine independence from Spain by means of a revolution. Bonifacio was born in Tondo, Manila on November 30, 1863. He came from a poor background. His father was a tailor. He was the oldest of 6 children. His parents died when he was only 14 years old and he had to stop school to help support his siblings. Andres was an avid reader and he read all of Rizal’s writings as well as the Bible and the History of the French Revolution. His leadership abilities enabled him to rally a big following as he prepared to strike against the Spanish authorities. However, before his group could attack, they were discovered by the parish priest in Tondo who reported them to the Spanish authorities. Luckily, Bonifacio and his men were able to escape to the hills of Balintawak. There, on August 26, 1896, Bonifacio and his men raised their rifles and sabers crying out, "Long live the Katipunan! Long live Philippine Independence!" Forthwith, they tore their cedulas (identification papers) shouting, "Kalayaan!" (freedom). This event became known as the "Cry of Balintawak" and is commemorated every year on August 26 at the foot of the monument erected in honor of Bonifacio and his followers. The revolution against Spain rapidly spread throughout the country. However, the poorly armed and ill-equipped Filipinos were no match to the Spanish army. To make matters worse for Bonifacio, a young revolutionary in the province of Cavite named Emilio Aguinaldo emerged, resulting in a rivalry for leadership. As a result, the group split into two factions, the Magdalo under Aguinaldo and the Magdiwang under Bonifacio. A violent confrontation between the two groups ensued and on May 10, 1897, Bonifacio and his brother were killed by Aguinaldo’s men.